The most extensive isotope analysis of archaeological material in Finland revealed a fragment of the history of ancient Finnish cattle: the bones and teeth showed which plants the animals fed on. 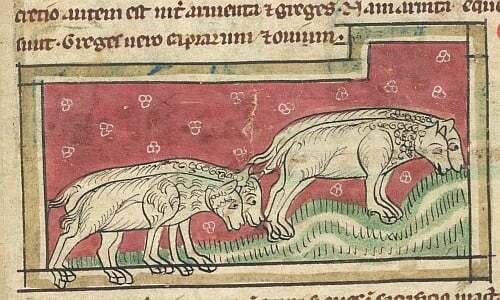 For thousands of years, the ancestors of today’s Finncattle and Finnsheep survived on scarce nutrition, but actually starved in the Middle Ages in particular. Isotope analysis of the bones and teeth of cattle and sheep discovered in archaeological excavations has produced new information on animal husbandry and nutrition in the old days, and the early history of today’s native Finnish breeds. The study was jointly conducted by the Natural Resources Institute Finland (Luke), University of Turku Department of Archaeology, University of Helsinki Finnish Museum of Natural History and Stockholm University Archaeological Research Laboratory. The project involved the most extensive isotope analysis of archaeological material ever conducted when researching Finland’s past. For the purposes of the study, 43 bovine and sheep bones or teeth were analysed. The oldest animal bone discovered during archaeological excavations dated back to the Bronze Age, about 3,300 years ago, while the most recent finds were from the 1900s. The isotopes accumulated in the bones, i.e. versions of elements with a different atomic mass, revealed that the feeding of animals most likely varied in accordance with the feed available in various settlements and in various years. On the basis of literary sources, it was assumed that, in the 1700s, cattle fed mainly on straw and sheep on the dried twigs of deciduous trees in winter. When the results of the isotope analysis were compared with data in the literary sources, it was discovered that the isotope values of cattle and sheep differed only slightly. “Whenever the hay harvest failed, all domestic animals had to subsist on the same feed, the dried leaves of deciduous trees and the leaves of various vegetables. The isotope values indicate starvation and the resulting physiological stress in years blighted by crop failure,” says Auli Bläuer, Academy Research Fellow of Luke. Domestic animals were forced to endure extremely difficult conditions, particularly during the long winters of the Middle Ages. “Data retrieved from the bone material also supports previous studies, according to which the animals became smaller during the Middle Ages. This is an indication of highly deficient nutrition. Only the strongest survived,” says Bläuer. Radio carbon dating methods were used to determine the age of the bones and teeth analysed. The prehistoric samples were approximately 700 to 3,700 years old, the medieval samples were from the 1200s to the 1550s and those from the Post-Medieval Period were from the 1550s to the 1800s. Population growth therefore made it more difficult to feed the animals. Settlements became more compact and more and more meadows were needed for agricultural purposes other than pastures. The resilient genetic resources of ancient domestic animals remain in today’s native Finnish breeds, Finnsheep and Finncattle, passing on the lines of the earliest animal populations. Many of the old indigenous breeds and thus the genes of ancient Finnish domestic animals were in danger of disappearing in the 1970s and 1980s, but are now safely stored via Finland’s national animal genetic resources programme coordinated by Luke. The results produced in the FinnARCH and BoNe research projects, funded by the Academy of Finland, have been published in the article “Inferring prehistorical and historical feeding practices from δ15N and δ13C isotope analysis on Finnish archaeological domesticated ruminant bones and teeth”, in the journal Fennoscandia Archaeologica.